I’ve been looking for some affordable, state of the art fly fishing sunglasses that aren’t just technically superior but aesthetically gorgeous. I found them at Costa del Mar; the Inlet design in Coral. I was drawn to Costa because I’ve seen them around on other sportsmen - on the ski slopes, bike trails, and of course, on the river. I now understand that they are so popular not just because they look good but because of the three claims to fame for Costa: Perform, Protect, and Explore. I took these platforms to test in a real world expedition carp fishing on the Colorado river. Yup – carp in the Colorado! Perform – as in lens and frame technology. Costa’s 580 Lens Technology is named as such because it blocks yellow light at the 580 nanometers on the light spectrum and provides unmatched razor sharp color enhancement and glare elimination. (Yellow light is the harshest light for your eye to filter.) This is paramount when you’re on the water. Gray lenses are great for activities on water or land in medium to bright sun conditions. Copper and Amber lenses are a great all around lens choices. They're also good for sight fishing. Blue Mirror lenses have encapsulated mirrors that deliver superior contrast and color in full sun while eliminating glare. They're best for activities on open water. These lenses start with a gray lens base. Green Mirror lenses are great for fishing inshore, on the flats, rivers and streams. These lenses start with an amber base. Silver Mirror lenses are great for freshwater sight fishing (fly fishing) and any outdoor activity with variable light. These lenses start with a copper lens base. Sunrise lens allows the most light to enter the lens and is best suited for low light conditions (e.g. early morning or late afternoon). Costa’s frames offer performance technology like sturdy co-injection molded frame technology, rustproof stainless steel hinges, no-slip Hydrolite nose pads and co-injected temple tips for an incredibly comfortable fit. They won’t fall off your face when you lean over your rig and they don’t pinch. Both lenses and frames come with a lifetime warranty against manufacturer’s defects. 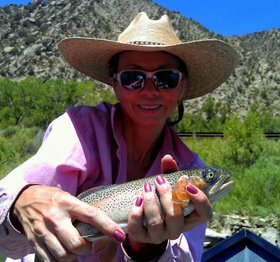 Protect – Fly fishing sunglasses do protect your eyes but that’s not what this platform is about. Think – protect your sport. For Costa, conservation is all about sustainable fishing. Many fisheries that should be vibrant and healthy are all but devoid of native fish because they have fallen victim to poor fishing practices, unregulated development, lack of watershed protection or all of the above. Costa works with partners around the world to help increase awareness and influence policy so that both the fish and fishermen of tomorrow will have healthy waters to enjoy. Explore - Whether it's exploring uncharted territories are protecting the planet, one fishery at a time, Costa is committed to helping others see more clearly what's out there. GeoFish – Costa’s GeoFish project follows a fly fishing quest around the world, with the team in search of the most epic spots ever fished. The GeoFish series documents lifestyles, adventures, mishaps, and camaraderie on an around the world epic journey. Thank you to Trip Dobson of Taylor Creek Fly Shop in Basalt CO for an incredible day on the water Performing, Protecting, and Exploring… and slaying some carp!